Eloge du Symbolisme is to be held on Tuesday 26th September by Artcurial. 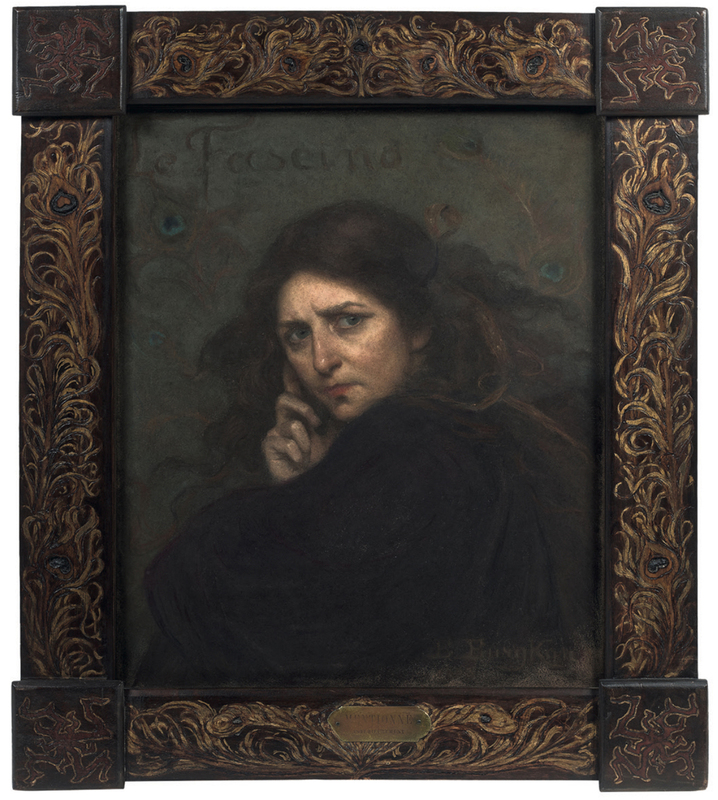 This sale includes a number of paintings framed in the artists’ own designs, or in revivals of antique patterns, giving the opportunity for a quick survey of some characteristic features of Symbolist frames. 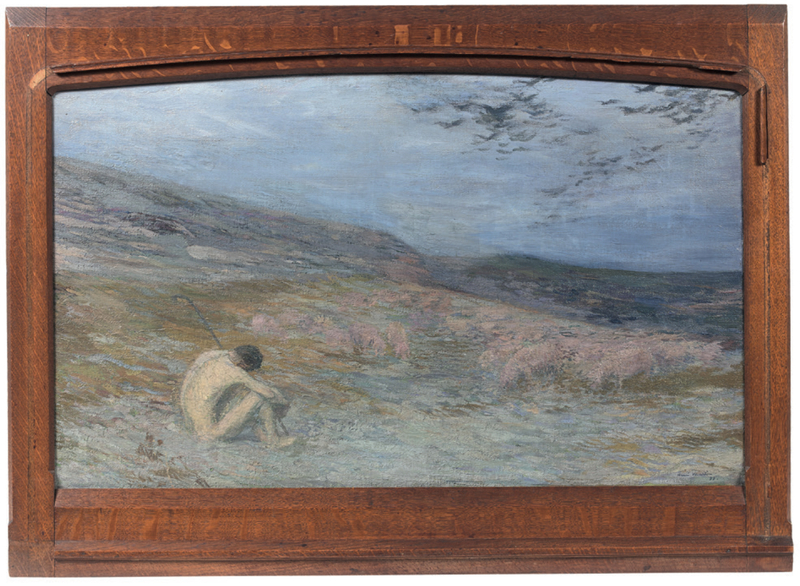 Examples of artists’ frames in the sale are illustrated below, along with comparative frames from elsewhere; for the e-catalogue see Eloge du Symbolisme: Une collection particulière et à divers. 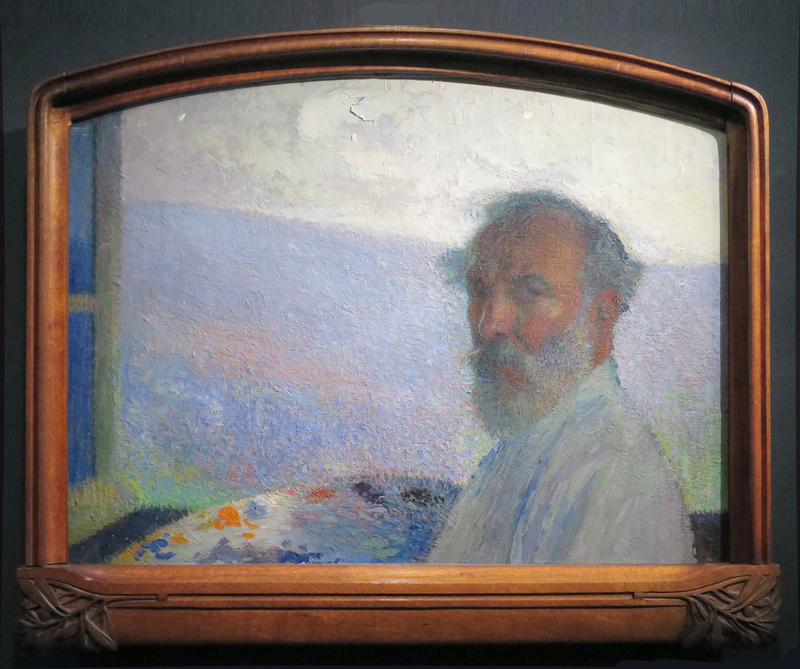 Although Henri Martin is now known primarily as a NeoImpressionist artist, after studying at the École des Beaux-Arts under the academic artist Jean-Paul Laurens he produced a large group of Symbolist paintings, and exhibited at the first Salon de la Rose+Croix in 1892. 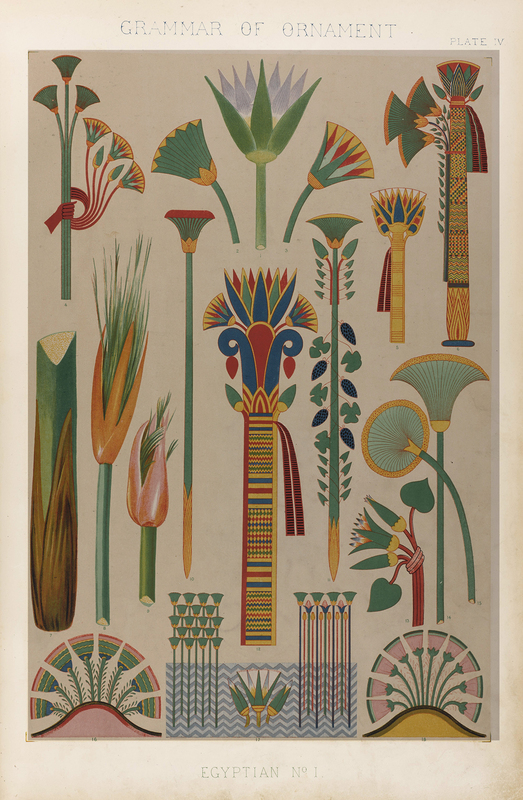 Amongst other artists exhibiting with the Rose+Croix were Ferdinand Hodler, Fernand Khnopff and Jan Toorop, all of whom were very interested in the effect of framing on their work, and all of whom produced idiosyncratic and strikingly modern frame designs. Martin’s are equally notable: he employs polished wooden frames in an Arts & Crafts or Art Nouveau idiom, with features including plain flat surfaces, rounded corners, or slightly arched tops. They are extremely effective settings for his work, both in its more Symbolist phase, and as it merged into PostImpressionist realism; they are also commercially astute choices, having much in common with contemporary interiors and furnishings in the same style. His La porte d’entrée, sold by Sotheby’s New York in 2007, has a frame almost identical to that of Lot 403, save that it has been gilded, either for Martin himself or a later purchaser. 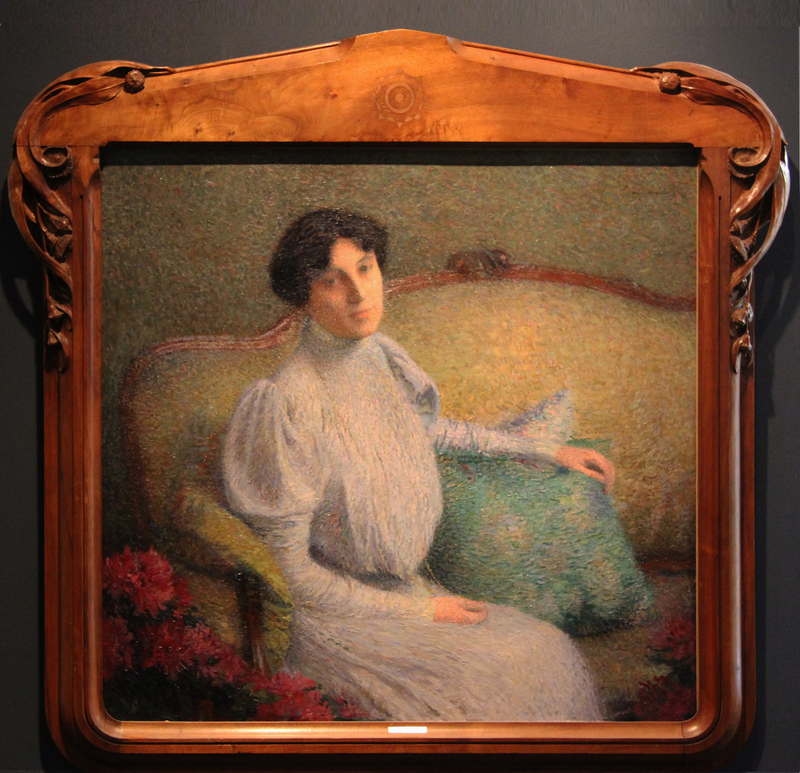 Martin’s portrait of Madame Tissier and his own Self-portrait of c.1912 both have polished wooden frames in similar style, the former carved with twining Art Nouveau flowers in the corners, and inlaid with a radiating sun within a star. The Self-portrait has a rainsill effect and carved foliate motifs at the bottom corners. In this company, the Prodigal son offered in the Artcurial auction fits seamlessly into a late 19th-early 20th century conception of the picture as a complete and unified artwork comprising the painting itself and the frame, and reaching out into the wider architectural interior. 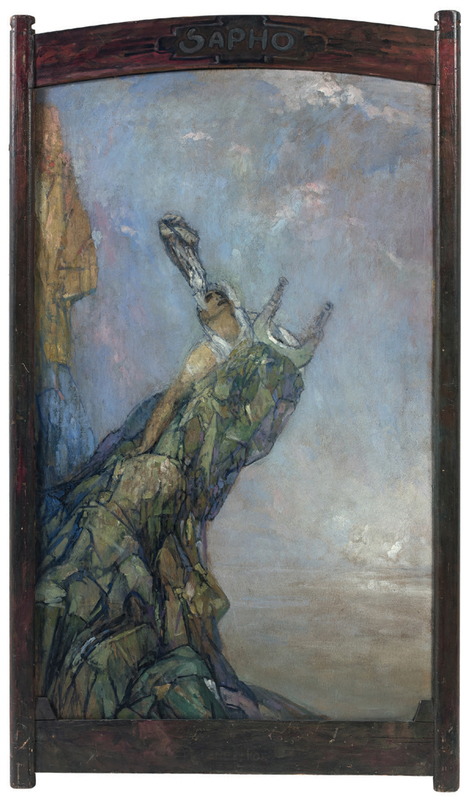 Marcel-Béronneau studied under Gustave Moreau at the École des Beaux-Arts, and was evidently profoundly influenced by Moreau’s interpretation of myth, poetry and Biblical femmes fatales. 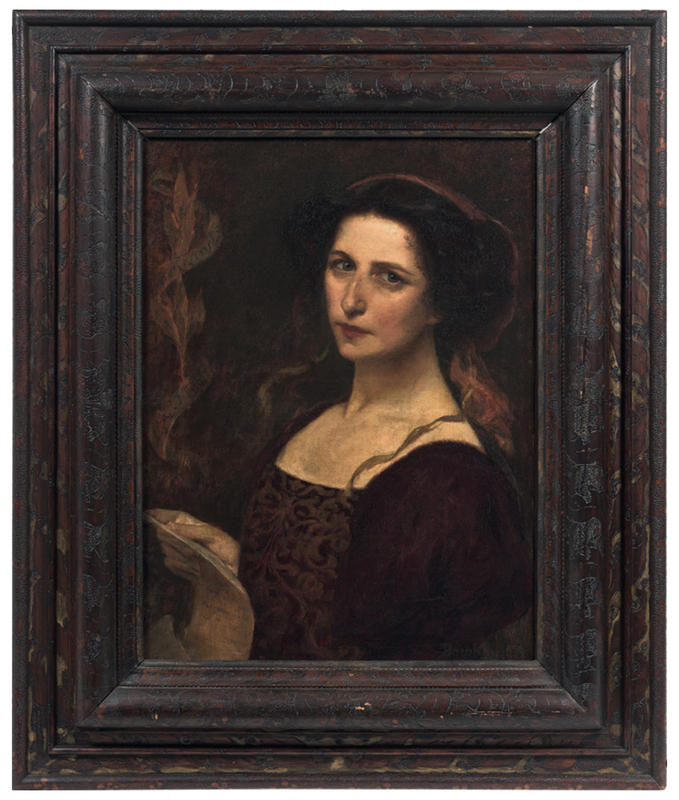 He had previously attended the École des Arts Décoratifs in his native Bordeaux, which may have reinforced his appreciation of Moreau’s own frame designs and catalyzed his own. 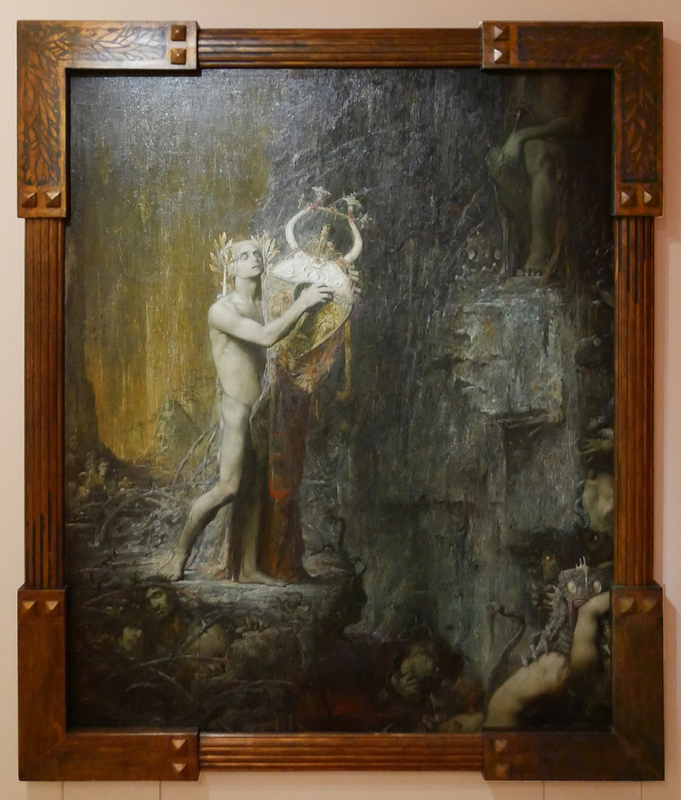 His frames borrow from the same Arts & Crafts/ Art Nouveau sources as Martin’s, but also from a reimagined Renaissance structure and ornament, like Moreau’s, or from a Gothic version, like Edgar Maxence’s. 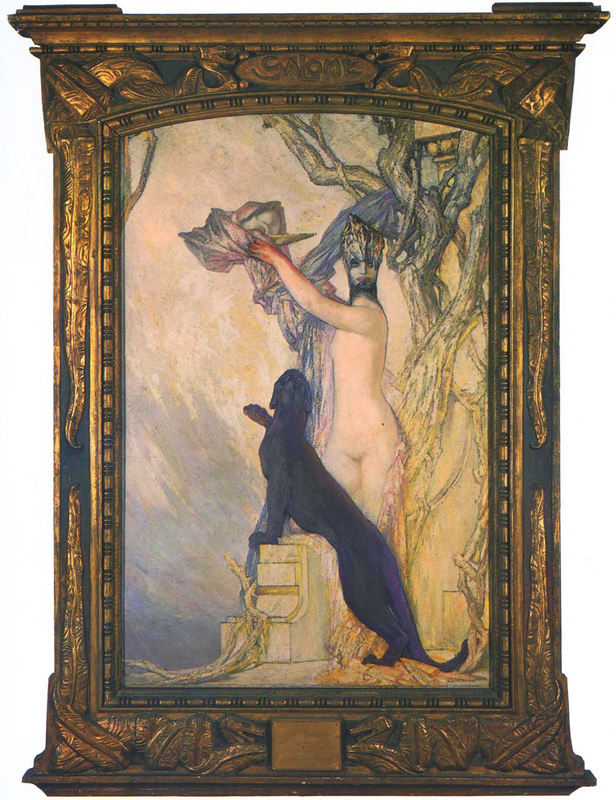 The frame of Douleur de Sapho is much plainer, similar to the leaf of a folding screen; its only ornament is the painted title plaque at the top, echoing the plaque in the entablature of Salome…, above. Like Martin’s Prodigal son, Sapho shares a close stylistic relationship with contemporary furniture. Kuklac was born in Slovenia but studied at the Academy in Vienna, and – rather like Henri Martin – painted Symbolist works in his youth and in a more NeoImpressionist style later on. He became a member of the Wiener Künstlerhaus and the Genossenschaft Bildender Künstler, also in Vienna. 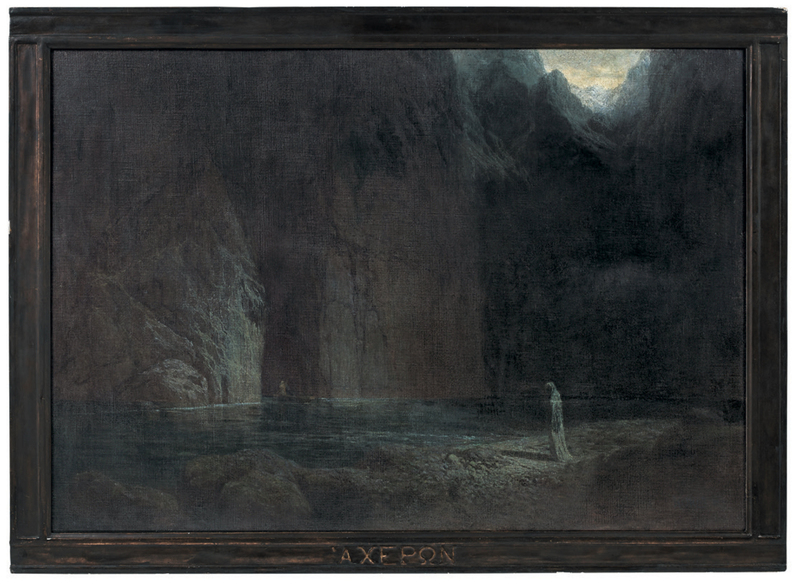 The influence of Böcklin on his Symbolist work is most visible in this, of all his paintings, which is clearly indebted to the several versions of The Isle of the Dead (painted from 1880-86); Böcklin was an enthusiast for revival Renaissance and Baroque style frames, and Kuklac was evidently amongst colleagues who were also interested in the presentation of their art. L’Achéron imagines one of the rivers of the underworld, which the dead must cross to enter Hades; Charon, the ferryman, emerges in his boat from the cavernous entrance, on his way to pick up the newly-dead soul who waits in the foreground. This less than jolly subject, rendered even more desolate than Böcklin’s island by its practically monotone treatment, has a frame which reinforces the theme both in structure and in colouring. It has a vestigially aedicular form, rather in the manner of Stuck’s minimalist aedicular frames, but stripped down to an even more skeletal form – pilasters, entablature and predella suggested by panels contained in linear mouldings. The title is incised in Greek letters on the base. 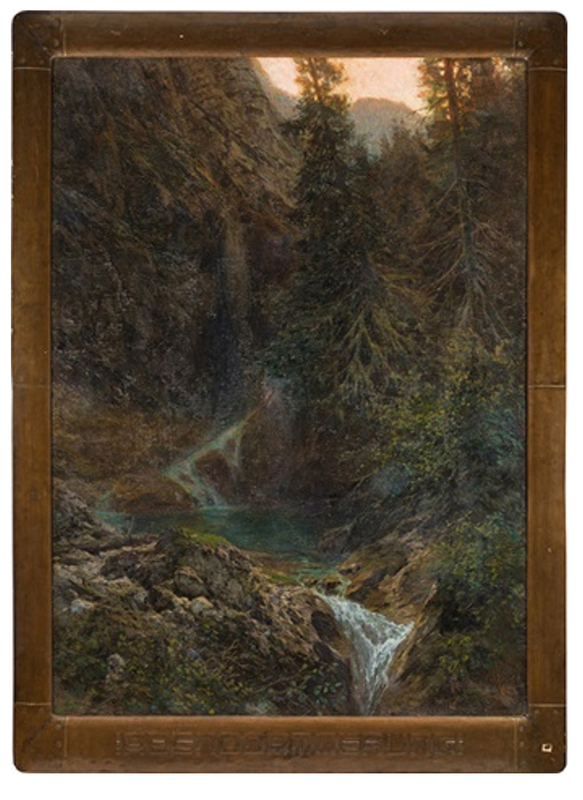 The frame on Abenddämmerung, or twilight, is also stripped back to a plain but contemporary form, which appears to be formed of sheet metal sections – like, but more functional in appearance than, Klimt’s frames – and again with the title inscribed at the bottom. The sale includes three heads by the comparatively little-known artist Berthe Burgkan; all apparently self-portraits, expressive, and fraught, as it were, with significance. Berthe Burgkan studied under Gustave Boulanger at the École des Beaux-Arts, and with Tony Robert-Fleury and Jules Lefebvre at the Académie Julian. She exhibited in Paris for more than forty years, mainly with the Arts de la Femme, and also the Salon des Artistes Français. As well as working in both oil and pastel, she evidently also experimented with pyrography – a technique which became very popular in the late 19th and early 20th centuries, when new processes were invented and the effects increasingly refined from the folk art medium of pokerwork. All three of these frames have been decorated to varying extents with pyrography, the most striking probably being the swirling, agitated peacock feathers on the frieze of ‘Le Fascino‘, which repeat the painted feathers in the background of the picture. This is probably the most wholesale intervention by an artist in any of the frames in this auction; it is clear that – although also designed by the artists – most of the others were almost certainly produced by other craftsmen from drawings of greater or lesser elaboration. Berthe Burgkan’s frames are fairly simple in structure, but she has taken their surface decoration into her own hands, and the process she is using is vividly apparent in the ‘eye’ of the peacock feathers, where the heart-shaped centre is clearly burnt into the wood. The feathers are then picked out in gilding, as are the strange knots of twigs or tendrils in the corner outset cassettes. 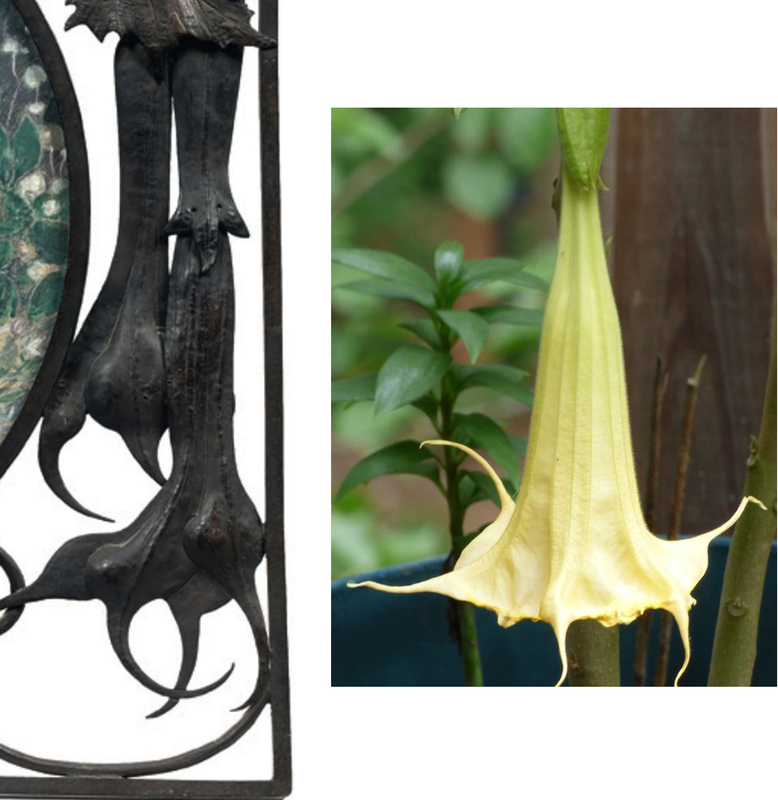 The very simple ‘plank’ frame of Herodias has also been ornamented with twining and flowering vines in pyrography; they are large and trumpet-shaped with prominent stamens, and could either be lilies or datura flowers – ‘angels’ trumpets’. The frame of Laura de Noves (Petrarch’s Laura) has a more sculptural, Baroque form of a bolection moulding frame, which slopes back from the top edge, near the painting, to the wall. 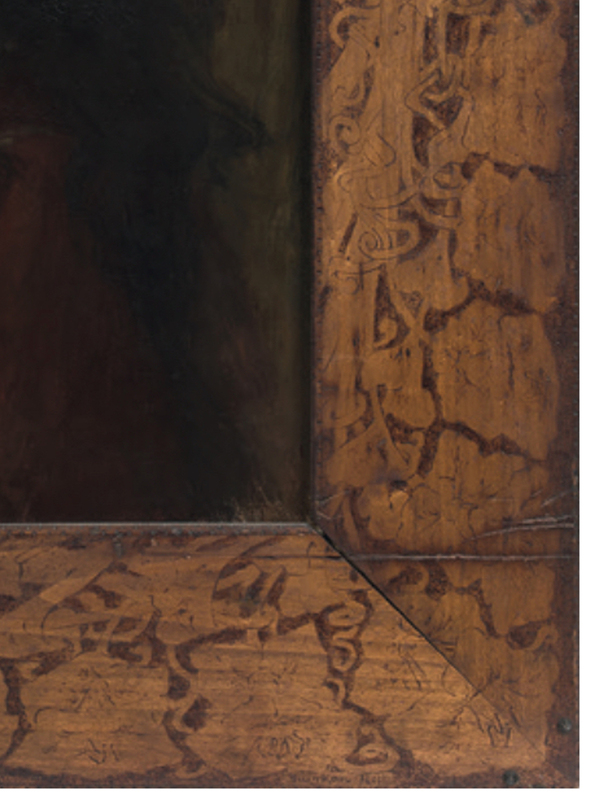 It is made of polished dark wood, into which a design of leaves has been burnt – quite ferociously, leaving a lot of evidence of the process, and giving the frame a distressed and time-worn air which the artist evidently wished to correspond with the subject. It is further proof of Burgkan’s willingness to experiment with a different medium to produce a completely integrated work of art. 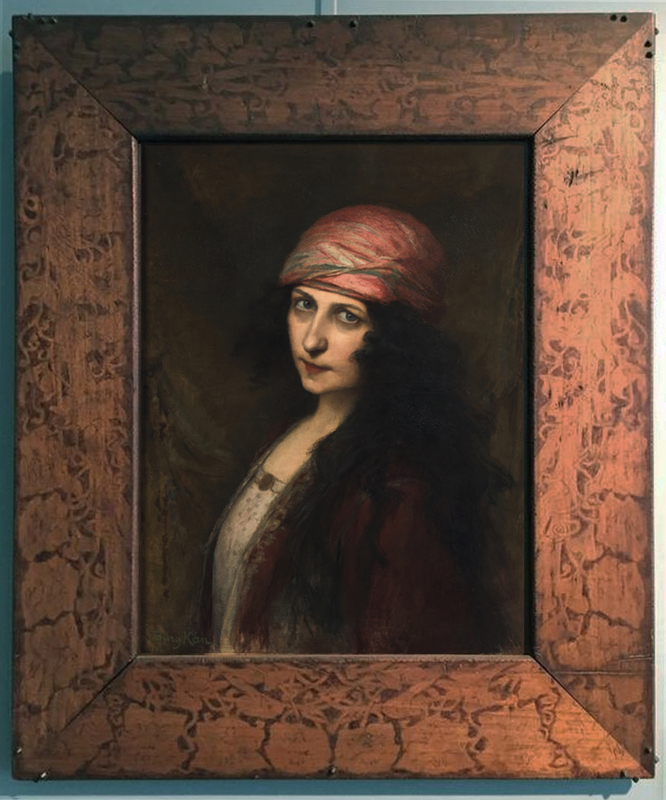 Georges Clairin studied with François-Édouard Picot (who also trained Gustave Moreau twenty years earlier), and in the École des Beaux-Arts; he later travelled in the company of his friend Henri Regnault, and with Gérôme, two notable Orientalists who designed or chose their own attributive frames for their work. He is noted for portraits of his friend Sarah Bernhardt and for his own Orientalism, both of which are combined in this work. 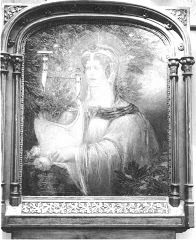 The inset metal plates at the corners of this frame are decorated with lotus flowers and buds which echo the flowers on the tiled wall of the painting, the actress’s headdress, and the foreground at her feet; all of them can be related to plate 4 of Owen Jones’s Grammar of ornament (1856), in the Egyptian section of motifs. Jones’s book was a seminal work for the second half of the 19th century, and was a great resource for picture frame designers, from the Pre-Raphaelites onwards. It’s curious that an apparently Indian rôle is surrounded by Egyptian motifs, but these were presumably part of the costume and set as the play was staged, rather than a mistake by the well-travelled Clairin. The corners of the frame and the motif top centre are immensely effective against the plain dark oak; they reflect the richness and exoticism of Sarah Bernhardt’s costume, and also lead the eye inward, via the diagonal compositional lines, to her hieratic, mysterious figure. 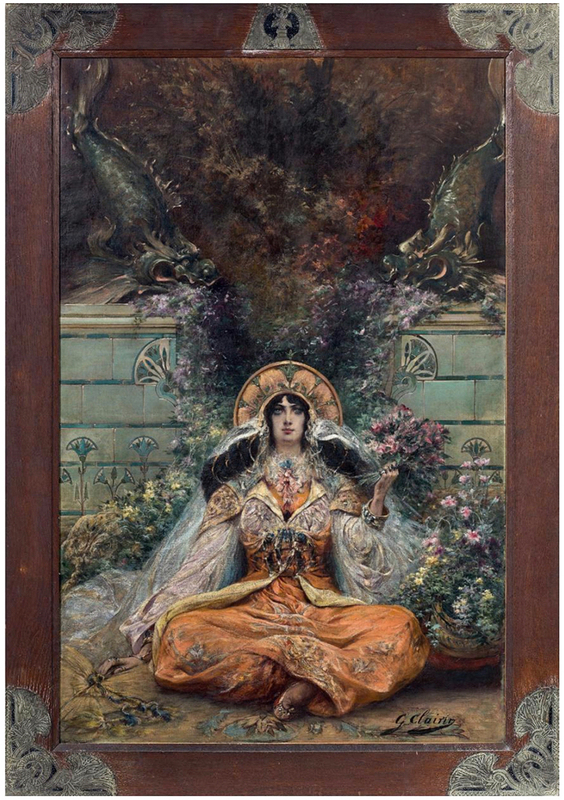 There is a second (putative) portrait of Sarah Bernhardt in this auction, utterly different in medium, composition, treatment, and – notably – framing. This is by that explosion of unBrexity European-ness, Louis Hawkins, born in Germany of an English father and an Austrian mother, who eventually took French nationality. He trained at the Académie Julian under Jules Lefébvre and Bouguereau, and exhibited with the Salon de la Rose+Croix and La Libre Esthétique. 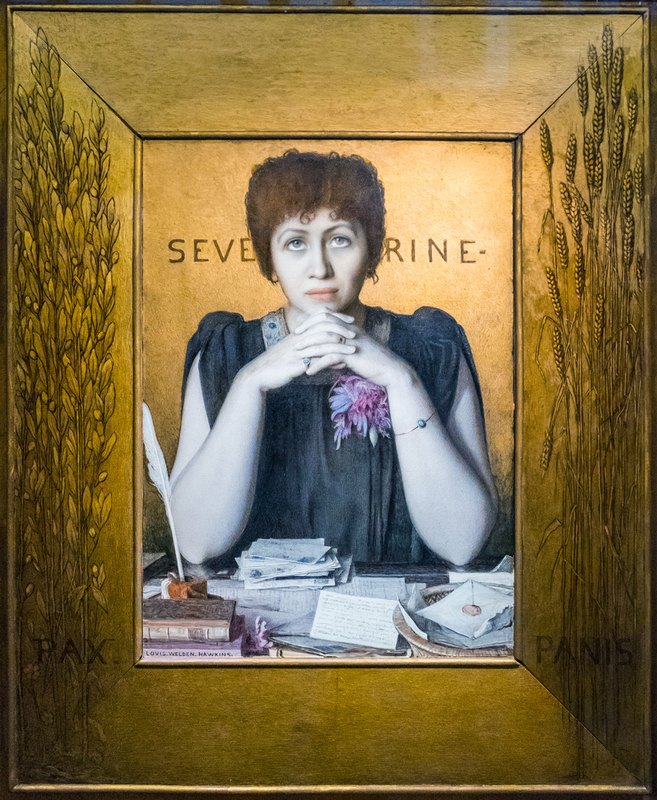 He is perhaps best known for his extraordinarily decorative portrait of the journalist, Séverine, for which he made – or at least decorated – the frame, to reflect the socialist beliefs of the subject. It is made of gilded oak with minimal mouldings, painted in monochrome, and inscribed PAX on the left, beneath olive branches, and PANIS on the right with stalks of corn. Setting aside the trophy frames freighted with symbols and emblems designed for the images of monarchs, this must be a relatively singular and early example of a political frame. 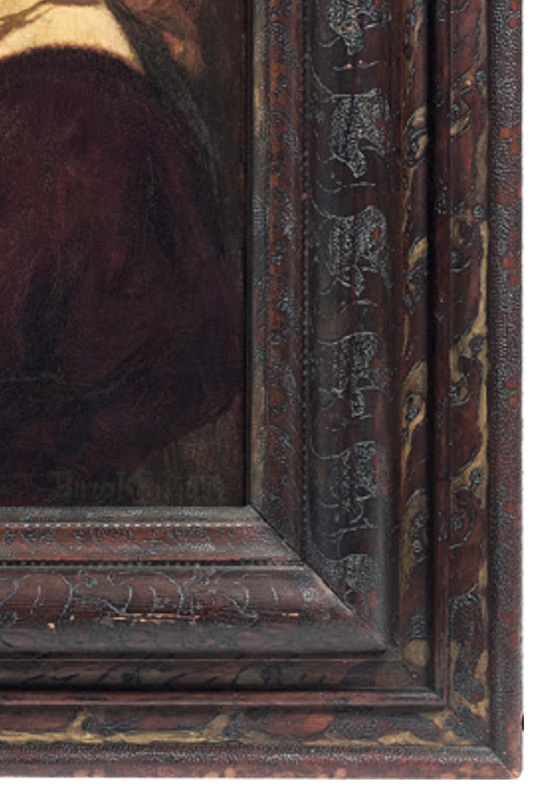 The frame of Lot 501 is very different – decorative and airy, although possibly also emblematic. The spandrels between the roundel and the outer frame are filled with vine leaves at the top, whilst zoömorphic flowers hang down into the lower spandrels, and broad leaves and a flower form a bracket or plinth at the base. 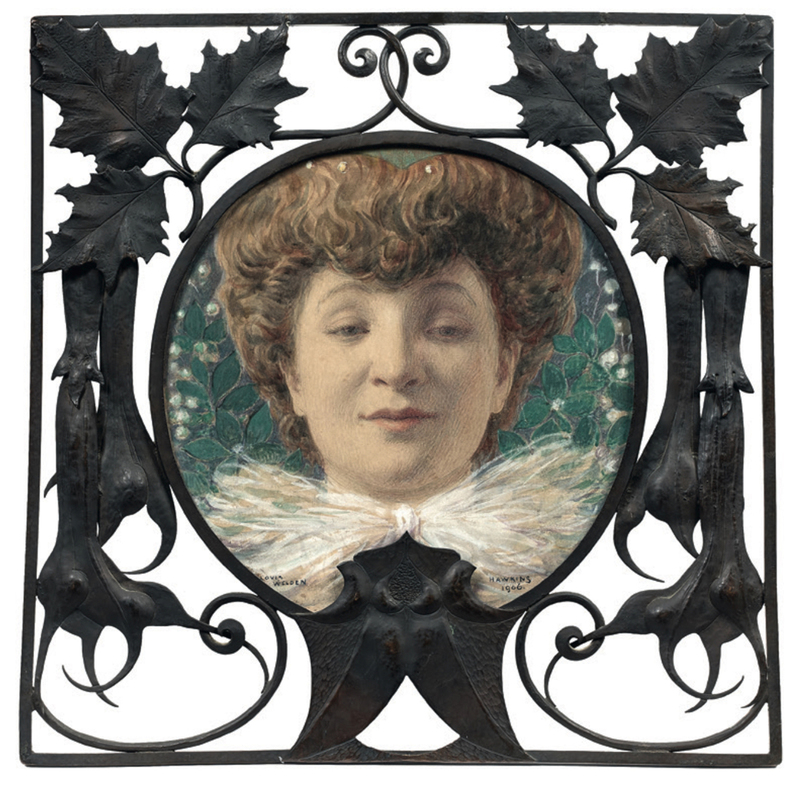 Provided that this is indeed the original frame, then the latter flower might be seen as a camelia, evoking Bernhardt’s rôle in La dame aux camelias; the pendant flowers at the sides may be the lilies that a young Oscar Wilde threw in front of the actress, for her to walk over, or – like the flowers on Berthe Burgkan’s Herodias – they may be ‘angels’ trumpets’. There are other interesting and appropriate frames on paintings in the sale, but they are mainly revivals or adaptations of earlier styles. The frames detailed above stand out for their inventiveness and individuality, and for the interest displayed by so many artists in creating an appropriate setting, which would reflect the work it surrounded, highlight it amongst other paintings, and also bind it to the contemporary interior in which it might hang. 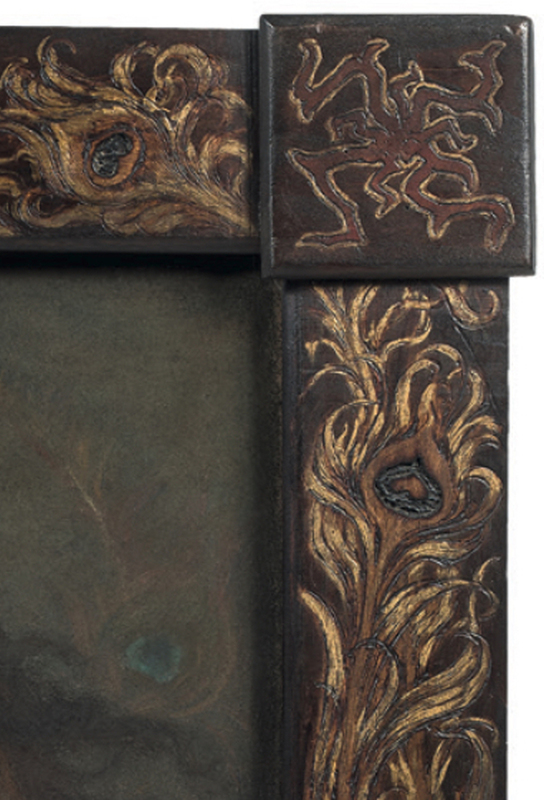 Love the art with the Symbolist label, and especially these frames: handmade, decorated, irregular, and thematic. How could we have lost so much in just 100 years?! Machine made grandeur, indeed! I think I would have been a much happier camper (artistic camper, that is) one hundred years ago! To my mind, we really reached a peak then, and have been on a slow decline ever since. I know the Victorian period was not the most liberated, but the art, design, and architecture produced then was among the highest, both technically and creatively, of any time.